Finally prying myself away from the BBC footage on Prince William’s engagement to Kate Middleton (BBC is no longer dead to me, as previously claimed…it still kicks and moans a little bit), I earlier tonight attended the “Made Without Gluten” Taster event at Otto Pizza in Notting Hill. 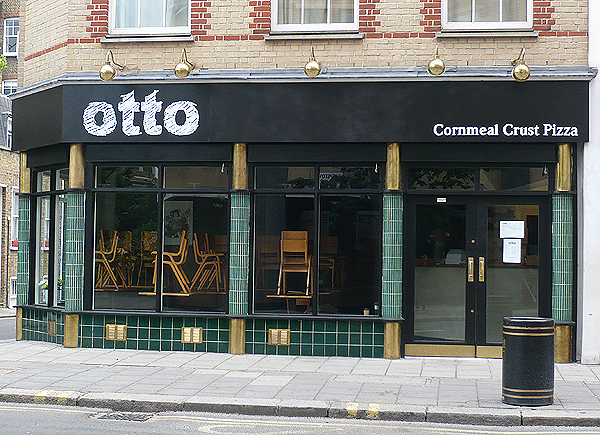 Recently opened this past summer, Otto Pizza is London’s first-ever pizzeria serving up a cornmeal pizza crust. Interestingly enough, owners Rich and Tom were inspired by a cross-country road-trip around the United States, when a friend’s recommendation to try the Dove Vivi pizza restaurant in Portland, Oregon became a new calling. This was my first time eating a cornmeal crust pizza, and now in addition to knowing it’s a healthy and more filling alternative to regular pizza dough, I fully realize how flavorful it is! Otto’s regular crusts are prepared with both cornmeal and organic wheat flour, which those who tend to suffer mild digestive issues after eating pizza find to be a great relief to their systems—and, along with them, those with gluten allergies can finally eat pizza again and enjoy it. We tried two versions of Otto’s made-without-gluten crust, the focus of this evening’s tasting. In my humble opinion, of the two toppings they offered with each, the first crust (more texture, more flavor) was a major score with the unexpectedly deeelicious corn and carmelized red onion topping—the taste and feel of all ingredients complemented each other so well. Likewise, the second crust (less texture, less flavor) was ideal for their sausage pizza, which was robust with flavor in and of itself and needed a sturdier crust like this to support the generous amount of topping. And did I mention that I personally have no issues with gluten yet loved this crust (both versions of it) as much as the regular one they offer? It was a whole new tasting experience, yet wrapped in the warm, familiar comfort of one of my first loves, pizza. And, as an American, I particularly adored their sausage as tasting the closest to what I can only seem to find at home—Otto Pizza makes their own sausage, in fact, and spices and smokes it to perfection. The flavor just bursts over your buds at first bite…I’m already looking forward to when I can return to sample their creative range of fresh toppings, which are that much easier to mix-n-match when the pizzas are sold by the slice as well as by the whole or half. Perhaps what impressed me most tonight was observing first-hand Rich and Tom’s passion for their pizza. It’s clear that it is a never-ending labor of love for them to experiment with new doughs and flavor combinations, as well as to treat the customer with friendly and attentive service—another inspiration they say they’ve brought back from the States. I do hope the feedback they received tonight proves fruitful for a successful menu and business, and I give them a lot of props for bringing something fresh and different to the London dinner table.